A global economic think-tank predicts accelerating growth for Canada over the next two years, but warns the Bank of Canada may have to hike rates earlier than expected. The Organization for Economic Co-operation and Development (OECD) says there will be a rebound in exports and business investment in Canada in 2014 and 2015, but there is a risk of "disorderly correction" in residential real estate. Why are home prices so high and when will they fall? Building of residential real estate should decline, because the current supply level seems to outstrip demand, the OECD said in its global economic outlook report, which is prepared twice a year. A sharp drop in house prices might hurt spending power at a time when Canadians have high household debt, it said. It warned the Bank of Canada that inflation may hit its target rate of two per cent by the end of 2014, leading to a need to raise interest rates earlier, and more sharply than expected, to keep it in check. Bank of Canada governor Stephen Poloz has said he doesn’t believe he’ll have to raise rates until 2015. The central bank has kept its policy rate fixed at one per cent since September 2010, leading to one of the most stable and favourable borrowing environments in many decades. The Paris-based OECD said those loose credit policies will help power business over the coming 18 months, but by the end of the year, the current slack in the economy will disappear. "With spare capacity narrowing by the end of 2015, monetary policy tightening may need to begin by late 2014 to avoid a buildup of inflationary pressures," it said. "It is assumed in the projection that the first policy rate increase occurs in the fourth quarter of 2014 and that the rate rises steadily to 2.25 per cent by the end of 2015." U.S. government shutdown: Is the debt ceiling a 'stupid' idea? The OECD praised the federal government’s efforts to bring the deficit to zero by 2015, and said provincial governments also had improved their balance sheets. The other wild card for the Canadian economy is what happens to the rest of the world. Ongoing uncertainty in the U.S., including slow economic recovery and the looming budget crisis, are the main risks for the economy of Canada and the world, according to a global economic think-tank. The Eurozone appears to be in recovery, but there is still potential for risk from the sovereign debt crisis. 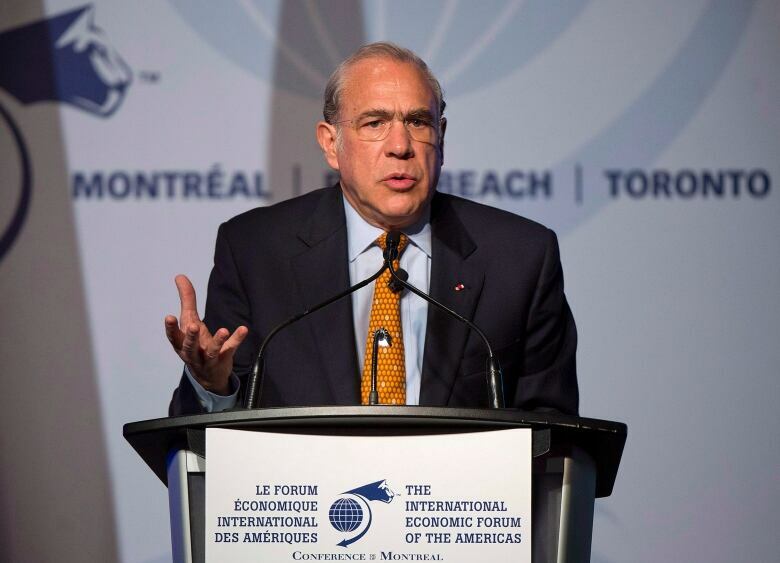 The OECD has lowered its forecast for global growth this year to 2.7 per cent, and 3.6 per cent for 2014, citing the slowdown in emerging economies as well as the risks posed by the U.S.
"We can't get [the world economy] out of first gear," said OECD secretary general Angel Gurria. The last time it reported, in May, it predicted 3.1 per cent growth in 2013 and four per cent growth in 2014. Emerging markets, which have helped shore up global growth in recent years, are beginning to lag. Such economies are increasingly important to the developed world represented by the OECD, it said, and a slowdown could help diminish prospects for Europe and North America. "The BRIICS [Brazil, Russia, India, Indonesia, China, South Africa] have been big machines of growth, they were pulling the world, and they are decelerating," Gurria said at a Paris news conference. But much still rests on what happens with the U.S. economy. The OECD chastised the U.S. for its brinksmanship over the budget, which shut down the federal government in September and recommended the U.S. get rid of its debt ceiling. The economy may have shrunk by 0.5 per cent as a result of the turmoil, the OECD said. "Brinkmanship over fiscal policy in the United States remains a key risk and uncertainty," Pier Carlo Padoan, the OECD's chief economist, wrote in a commentary accompanying the report. It predicted modest economic growth in the U.S. in 2013 and an accelerated pace of growth in 2014 and 2015 as employment prospects brighten and business invests. But it urged caution over Federal Reserve tapering, saying premature exit from the monthly bond-buying program risks cutting off the fragile recovery, but delaying tapering could create financial instability in the rest of the world. It urged the Fed to begin tapering early in 2014.